I purchased some fancy embellishments and a huge black daisy that I thought I could pull apart and attach to the mask like feathers. 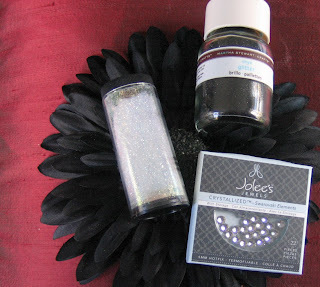 The white container has super fine iridescent glitter, while the other is Martha Stewart fine black glitter. It's really beautiful. 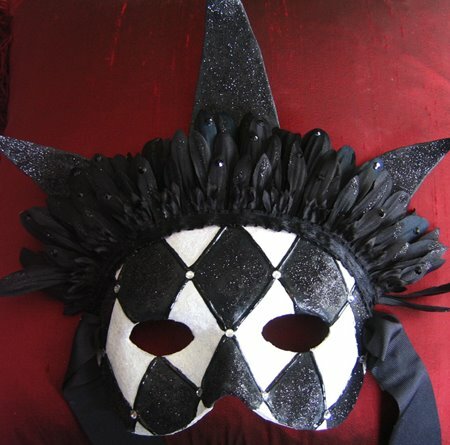 I also bought some Jolee's Jewels Swarovski crystals in clear and black to add to the mask. I decided that the three horns on the mask needed to be black, so I painted over the white ones and added black glitter to all three. Then, I put one more coat of paint on the diamond shapes and added glitter. The pictures really don't do the glitter justice. The diamond shapes and the horns are covered with glitter! I outlined the diamond pattern on the mask in black dimensional fabric paint and used E6000 to attach the petals and crystals. I pulled the flower apart and cut the petals into several sections that I glued around the crown of the mask in layers. I added a nice ribbon across the top to give it a more finished look, then made holes on the sides of the mask to attach long black grosgrain ribbons to tie it on. Mask complete! Whew! That was a lonnnnng project! Michael delivered the mask yesterday and Mardi Gras guy was very pleased with it. I told him that if any of his friends were interested in a custom order, to tell them it would cost $200 bucks (I charged him $100)! Wow! That is an amazing work of art! Your extremely talented! 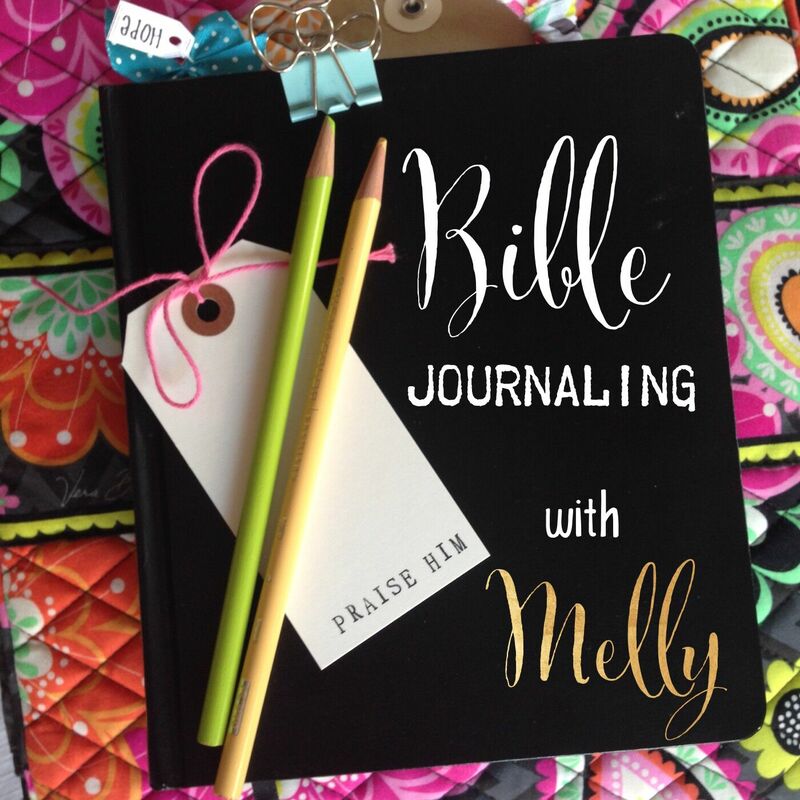 Thanks so much for your comment on my blog and for becoming a follower! I really enjoy paper crafts...very addicting! Anyway, just wanted to say thanks and I will be back to check out your blog again also!